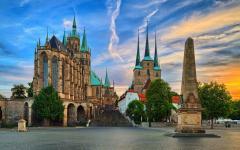 To commemorate the 500-year anniversary of the Protestant Reformation, this custom tailored tour follows in the footsteps of Martin Luther, the main driving force behind the Reformation. 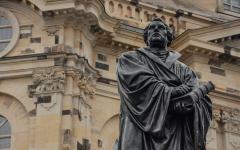 From visiting the church where he posted his 95 Theses, officially starting the Reformation in 1517, to savoring German craft beer perfected by monks living in a historic monastery on the Alps, the life of Martin Luther has cast a distinct path through German history and beyond. From Berlin to Munich, and the preserved medieval villages in between, retrace the steps that have had a profound impact on world history. In 1517, Martin Luther changed the course of history by posting his 95 Theses, which sparked a debate within the Catholic Church. 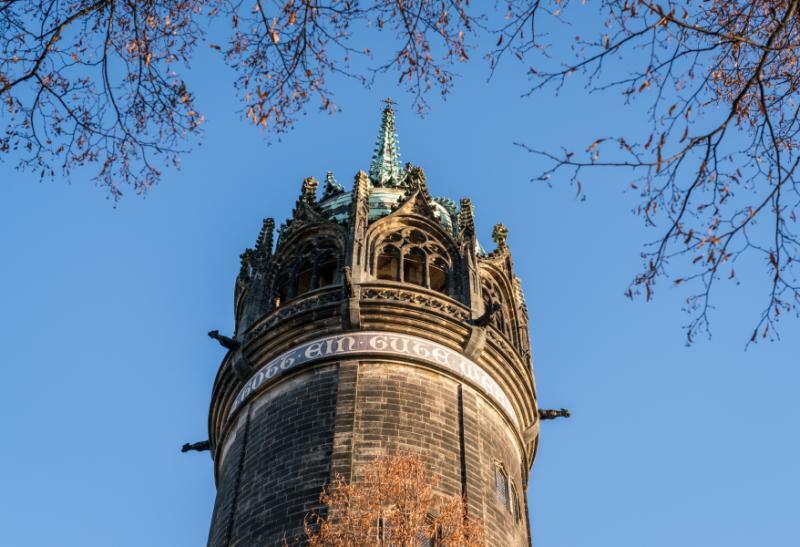 Your customizable tour follows in the footsteps of Luther to discover the history of Germany and the path that the people and churches took before and after the pious monk nailed his arguments to the door of the Schlosskirche Church. Your discovery begins with your arrival in Berlin. Your private transfer greets you at the airport and escorts you to the heart of the city to check into the comforts of your gorgeous hotel. 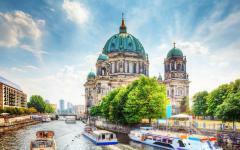 Your guide greets you in the lobby and leads you on an introductory tour of the city, viewing the Brandenburg Gate and East Side Gallery before stepping aboard a Spree River Cruise. The tour ends in the Parliament building with a view of the glass cupola. Optional: If your flight lands early, you can visit the celebrated Boros Bunker, home to a stunning display of contemporary art inside a surviving World War II bunker. On the second day, you set out into Berlin once again with your guide, stepping back in history with the most recent events first. 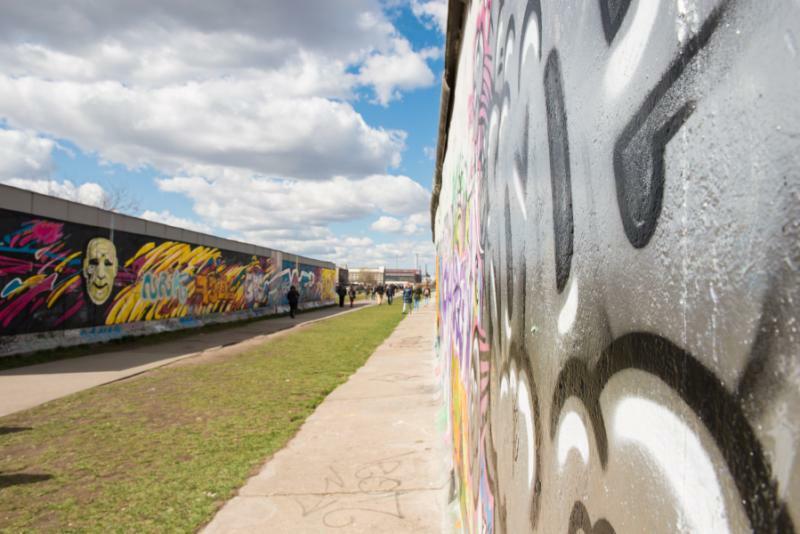 Embark on a Cold War tour of the Berlin Wall before visiting monuments and sites connected to the rise and fall of the Third Reich. 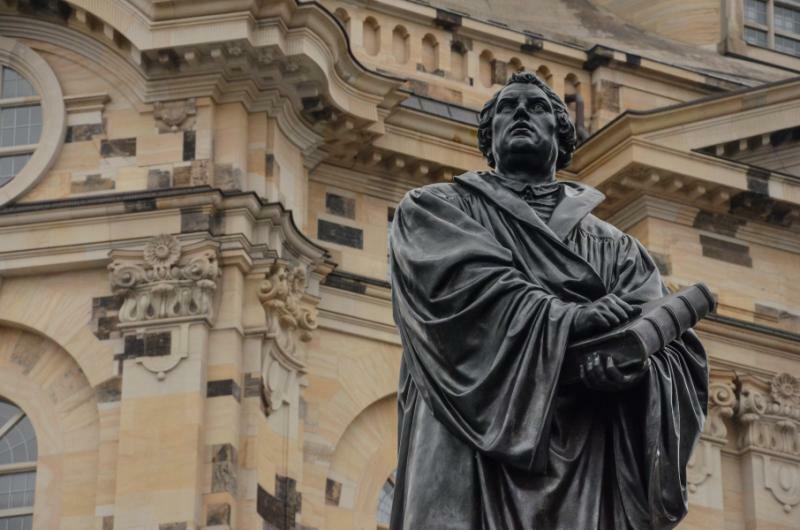 You continue deep into history at the German Historical Museum to view the special exhibition of the Luther Effect, a gallery illustrating how Martin Luther’s teachings spread across Germany and the world. The next day, your private transfer escorts you from Berlin to Wittenberg. 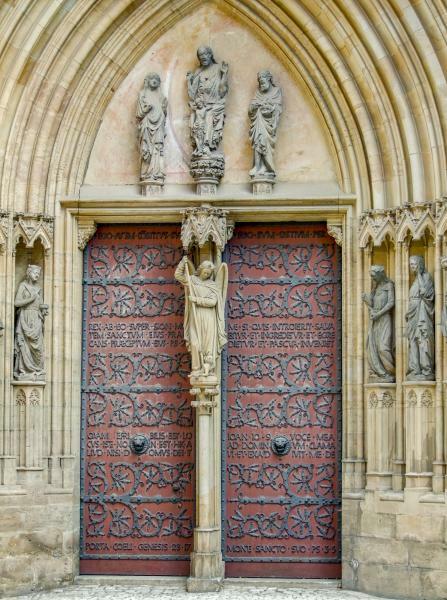 Explore the church portal immortalized by Luther’s act of defiance and visit the monastery and home of the Luther family before stepping into St. Mary’s Church. Optional: Take a brewery tour of Brauhaus to learn about monks in Western Europe and their deep, important connection to beer. Travel through the historic lands of the Reformation, beginning at Eisleben, the birthplace of Martin Luther, as well as the home where Martin Luther passed away. Visit the monk’s birthplace and the various churches that are connected to the protestant cause. 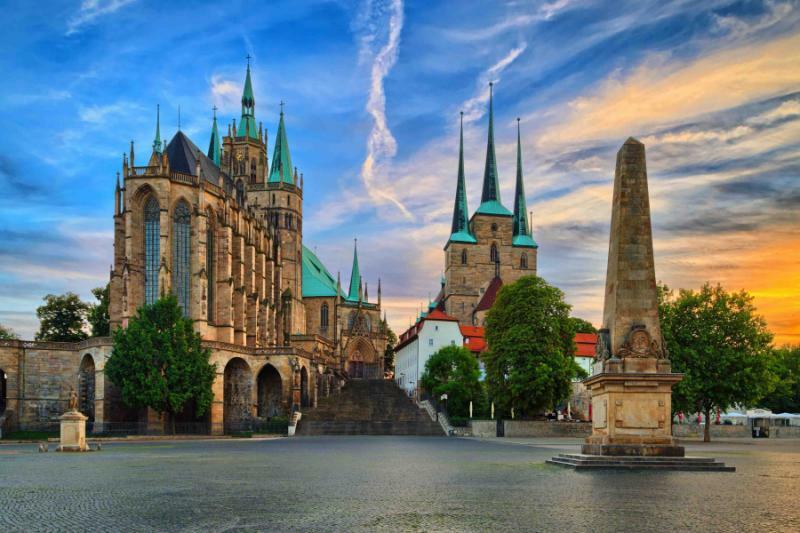 Travel to Erfurt by private transfer to enjoy the enchanting medieval architecture. Visit the Merchant’s Bridge and the Augustinian Monastery. Then, your private transfer escorts you to Eisenach to a welcoming hotel in view of the stunning Wartburg Castle. Enjoy a tour that takes you through the fabulous castle grounds before visiting the Lutherhaus and Museum. 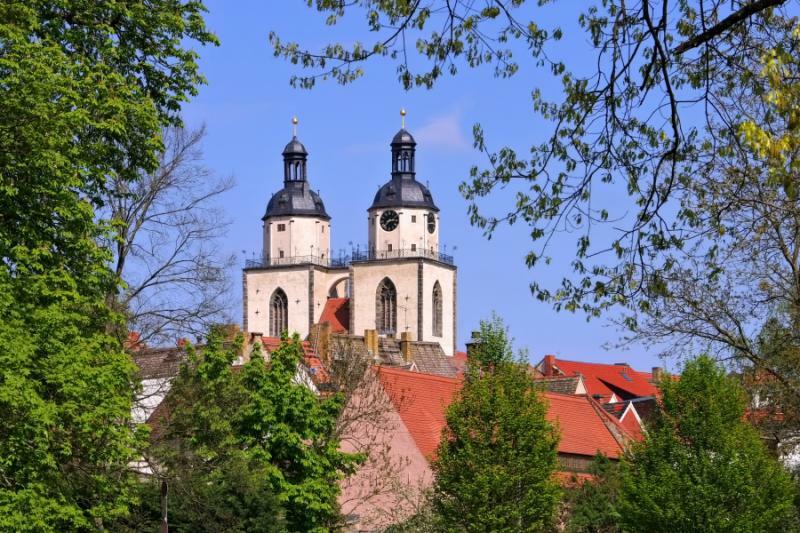 The town is also home to Johannes Sebastian Bach, offering insight into one of the most famous names of Classical Music. Next, your private transfer escorts you to Rothenburg, stopping first in the medieval town of Würzburg. Enjoy the historical charm and the youthful ambiance of the university. 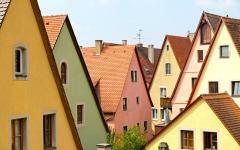 After reaching Rothenburg, you can relish the treasure chest of medieval preservation. 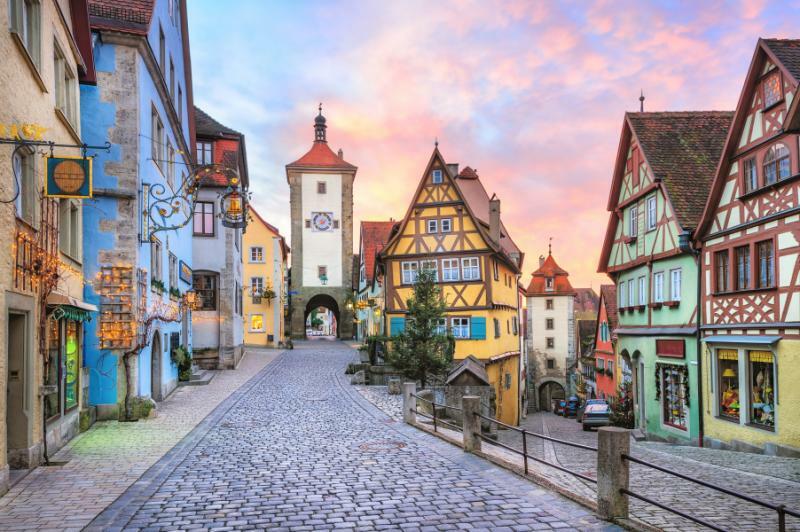 After dinner, you embark on the Night Watchman of Rothenburg Tour, following a medieval knight in authentic dress through the lanes of the city. 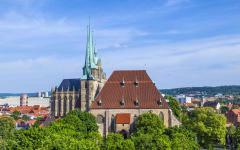 Optional: Extend your time in the area to visit Nuremberg, once the Imperial City during the Middle Ages. On day seven, you follow the Romantic Road to Augsburg. 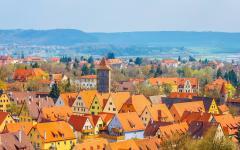 The gorgeous scenery leads to the medieval villages of Dinkelsbühl and Nördlingen. 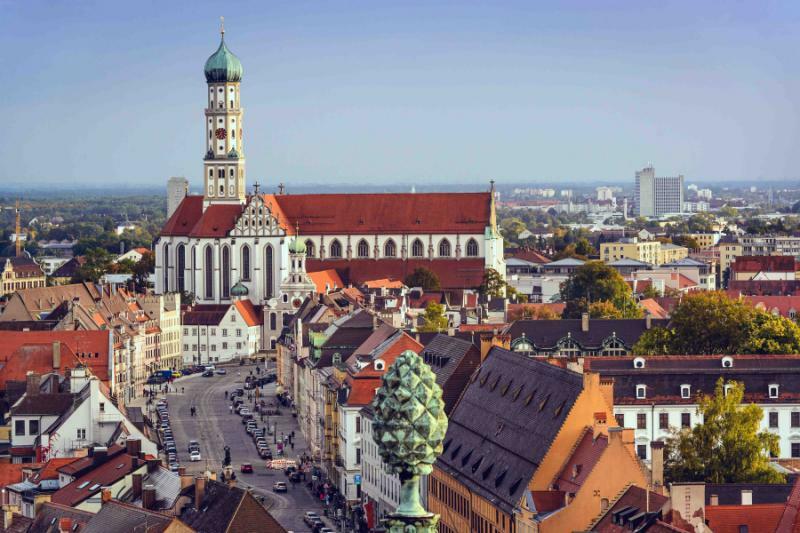 Upon reaching Augsburg, you explore the extraordinary wealth of the Fugger Family and the lingering effect Martin Luther and the Reformation made on the city. Travel to Munich, with a stop at the Andechs Monastery along the way. During your visit to the monastery, you can sample an array of beers the monks have brewed for centuries. Spend time in the luxuries of your hotel overlooking Viktualienmarkt Square before exploring the cobbled streets and Mediterranean-like atmosphere of a city sitting on the foothills of the Bavarian Alps. Optional: On day nine, you can visit the Dachau Concentration Camp for insight into the lives of those interned during World War II. You can also spend time with the unique art collections inside Pinakothek der Moderne. Your Munich tour takes you through the English Garden and grandeur of the Nymphenburg Castle. Discover the charming neighborhood of the capital of Germany before indulging in the culinary splendors of a local restaurant. On the final day, your private transfer meets you at the hotel and escorts you to Munich Airport for your flight home. 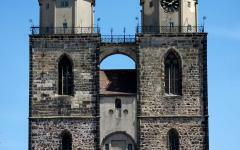 Two days in Leipzig and Dresden to witness magnificent architecture and remarkable canyons. Two days at Neuschwanstein Castle and the Bavarian Alps to find stunning mountain peaks and fairytale castles. Two Days in Mainz and the Rhine Valley to view the Gutenberg Press and marvelous scenery of vineyards and shimmering riverbanks. 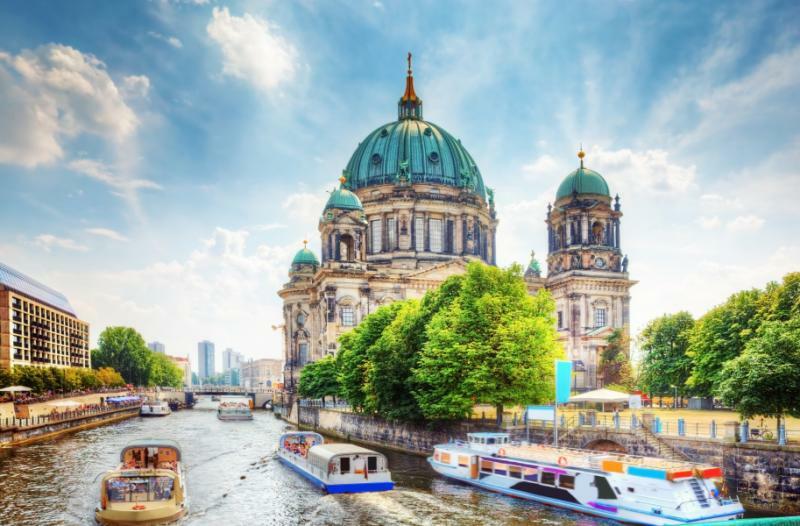 The capital of Germany beats with captivating history, vibrant modernity, and unforgettable culture that effortlessly blends glamour and determination. The past textures the city with revolutions and concrete walls, cutting-edge architecture and Prussian opulence. The 18th-century Brandenburg Gate contains neoclassical design carved out of shimmering sandstone to stand more than 85 feet tall. A more than 1,300-foot long canal recalls Berlin’s former prestige wrapped around the city’s important museums, including the National Gallery. Your flight lands at Berlin International Airport, where your private transfer meets you upon your arrival. Students, artists, and young professionals revel in the relaxed ambiance of a café in the diverse Mitte neighborhood, known for being the celebrated heart of Berlin. The aroma of grilling sausages and freshly baked pretzels emanates from a vibrant beer garden. The Markthalle IX, a popular market hall, fills with Berliners eager to find fresh vegetables and locally sourced meats, along with the offerings of the Heidenpeters Microbrewery. You settle into the comforts of your luxurious hotel, located near the iconic Brandenburg Gate. After taking the time to enjoy the comforts of your accommodation, your guide greets you in the hotel lobby. 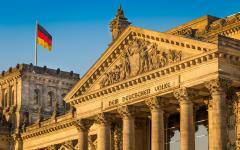 You are ready to venture out on a remarkable introductory tour of Berlin to discover the monuments and culture, understanding how the city has become an important destination for travelers from around the world since its crowning as the German capital in the 19th century. Three of Berlin’s historic buildings border one of the city’s largest squares at Gendarmenmarkt. The plaza was designed in the 17th century. The Schiller Monument stands in front of the 19th-century Konzerthaus Berlin Theater. Four female figures adorn the fountain canopy and represent Lyric Poetry, Drama, History, and Philosophy. You continue to the banks of the Spree River and board a riverboat. The breeze brushes over the water and cools as it washes over the boat. 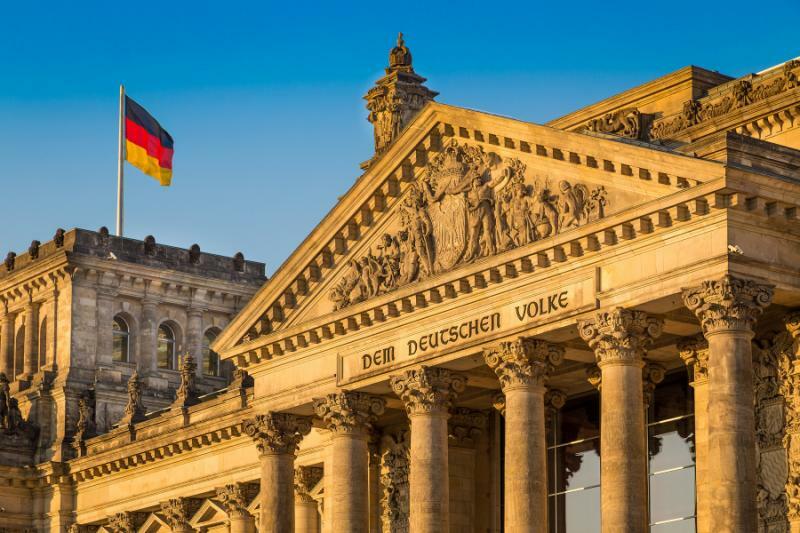 From the pristine perspective of the river, you can view the Reichstag, Parliament, and the soaring figure of the Fernsehturm Television Tower, which stands more than 1,200 feet above the surrounding streets. Optional: Depending upon the time of your arrival, you have the opportunity to visit the Boros Bunker. A private collection of contemporary art decorates one of the city’s surviving World War II bunkers, embodying Berlin’s ability to blend history and modernity, as well as celebrate culture in the shadow of its past. 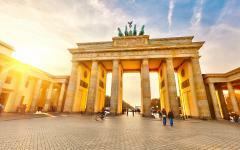 In the morning, the sunlight washes over the cobbled streets by the Brandenburg Gate. The brass figures atop the portico glint green against the layers of colors emanating from the sandstone. 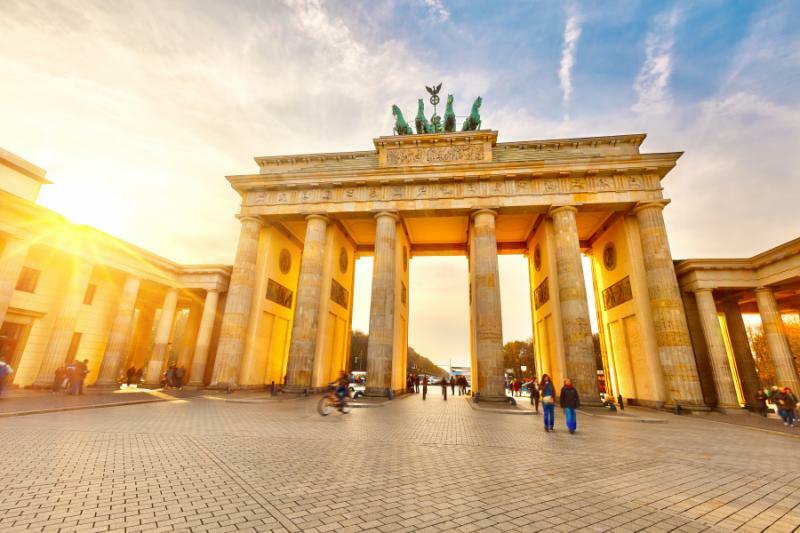 After breakfast, your guide meets you in the hotel lobby, keen on taking you deep into the culture and history of Berlin on your private tour, beginning with the epic drama of the Cold War and the Berlin Wall. While your guide speaks about the history of Wall, you can feel the pulse of jubilation that ran through the crowd gathered at the Brandenburg Gate. The Wall divided Berlin between East and West from 1961 to 1989. You make your way to the preserved symbol of the separation at Checkpoint Charlie. Chills run down your spine as you think of how close American and Russian tanks must have been when facing one another at gunpoint as tensions between the two countries escalated. Remnants of the wall reach a height of more than 13 feet and once dissected 55 streets with nearly 300 observation towers. Graffiti glows against the backdrop of the faded concrete, speaking to the artistic and thriving spirit of Berliners. 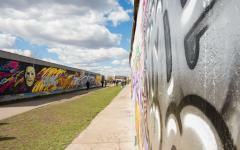 A nearly two-mile stretch of the wall has become a memorial, offering reminders to the world of the way the Cold War affected those in Berlin and across the world. You continue to reach back in time to the heart of the Nazi regime in Berlin, which lasted from 1933 to 1945. Your guide immerses you in Berlin’s past before stepping face to face with a special exhibition in the German Historical Museum commemorating the 500th year anniversary of the Reformation. The museum opened in 1987 on the 750th anniversary of Berlin’s founding. Natural sunlight spills through the ceiling windows to the recent extension. The exterior bricks shine with gold-hued sandstone with the exhibition halls encompassing four floors and more than 86,100 square feet. The exhibition leads you through the ways Protestantism changed history and the world by tracing the concepts of the faith’s tenants and the encounters that clerics had while passing the doctrine through different cultures, from Sweden to South Korea, the United States to Tanzania. The gallery also provides historical context to Luther’s 95 Theses. 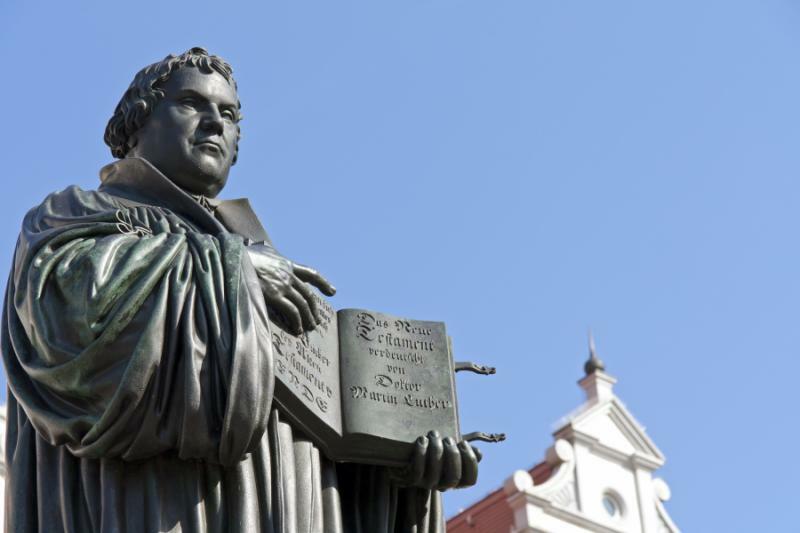 Your first steps in following Martin Luther provide you with insight into the mindset of the monk who, through his thoughts on piety, changed the trajectory of Western Europe, and the world. In the morning, the aroma of grilling meat emanates from the popular traditional Döner kebab (rotating grilled meat) restaurants around the city. The bakeries in the Kreuzkölln district display freshly made cakes and muffins, with the scent of rich, creamy coffee drifting through the doors and onto the street. 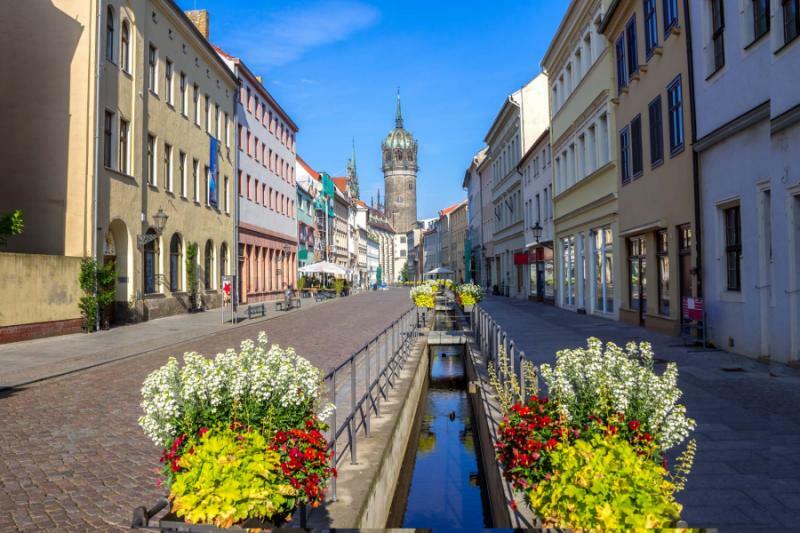 After breakfast, your private transfer meets you at the hotel and escorts you from the vibrant daily life of Germany’s capital to the preserved city at the heart of the Reformation: Wittenberg. The town has had a youthful, student atmosphere since the University of Wittenberg was established in 1502. The town rises out of the north bank of the Elbe River. The waters rush beneath the foothills of the Fläming Hills, offering abundant greenery and the tranquil sound of water rushing over the riverbed. You check into the comforts of your gorgeous hotel overlooking the Castle Church. Your guide greets you in the lobby and leads you through the town, beginning at the doors of Schlosskirche, the Castle Church first erected in 1509. 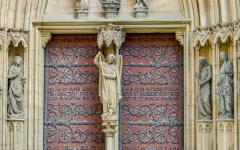 Gothic architectural designs frame the bronze doors in the portal, which commemorate the original wooden doors upon which Martin Luther nailed his 95 Theses. His arguments fought against the sale of indulgences, a practice that Luther believed was corrupt, but promoted by the Catholic Church at the time. Luther printed his arguments from the Gutenberg Press, enabling his protests to spread across the German-speaking world, along with Latin-speaking students and members of the church. 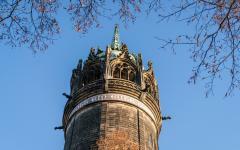 A tribute to Luther stands along the Round Tower, referencing a hymn of the monk. Nearly 300 steps lead to the top of the 290-foot tall tower, providing a remarkable view of the city and the surrounding countryside. The preserved medieval town retains an enchanting ambiance, from the cobblestone streets to the courtyards offering cultural performances inside the former residence of the Cranach-Höfe. Colorful homes line the walkways with locals strolling beneath the red-tiled rooftops. The home of the Luther family contains a statue of Katharina von Bora, Luther’s wife. 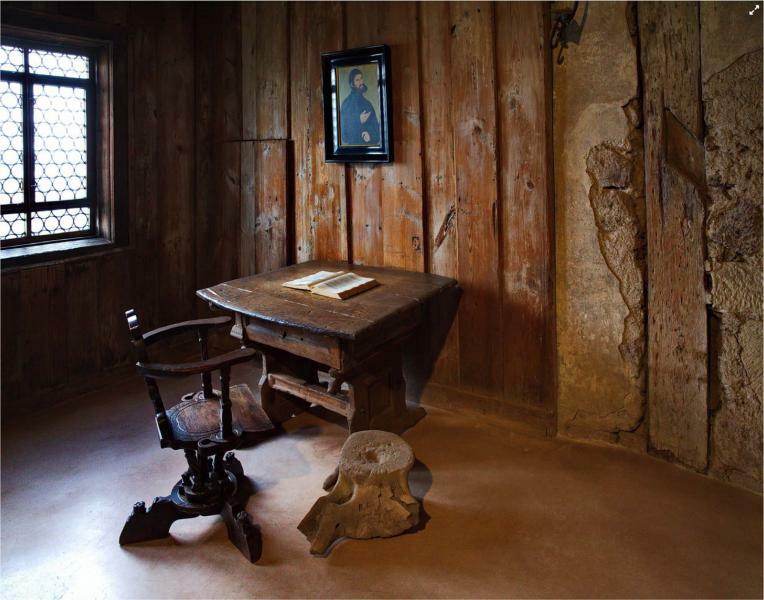 Lutherhaus, Martin Luther’s house for over 25 years and the place where he wrote his 95 Theses, has been operating as a museum since the late 19th century and provides exhibitions on the man Martin Luther was, the monk he aspired to be, and the impact he made on world history. Your guide leads you to Cranach’s Ten Commandments, located in the refectory. The stone offers a cooler temperature inside the former home. The soft light gently illuminates the wooden panels painted with the commandments. Optional: Follow the path of Martin Luther and his wife in their ability and love of brewing. Enter the Wittenberg Brewery House for a hands-on experience, learning about the process of brewing beer while enjoying the lively atmosphere of a popular beer hall. Water in the Middle Ages was often unsanitary, making beer a popular drink due to its cleanliness and flavor. Work on the 16th-century water pump that continues to bring clean water from a mountain spring and learn the traditional recipes that the monks have passed down to produce crisp, refreshing, and filling beer of which Germans are still proud of today. The morning light washes over the vibrant colors of the historic Market Square. Gothic windows shimmer against 16th-century balconies overlooking the entrance of Town Hall. After breakfast, your private transfer greets you at the hotel and leads you away from the noble city of the Reformation to reach Eisleben, where Martin Luther was born in 1483. The former mining town retains its relaxed ambiance with numerous dedications to its most famous son spread around the cobblestone streets and peaked rooftops. The famous reformer also passed in the comforts of his birthplace in 1546, claiming Eisleben to be his original Fatherland. Old Town dates back to the 10th century with the surrounded suburban streets founded between the 12th and 16th centuries. Church of St. Peter and St. Paul contains two inspiring Gothic altarpieces and retains the celebrated claim of having been the church in which Martin Luther was baptized. The interior contains hints of frankincense and myrrh drifting beneath the vaulted ceilings. At the heart of the middle chancel stands the baptismal font bearing a Latin inscription demarcating the site. 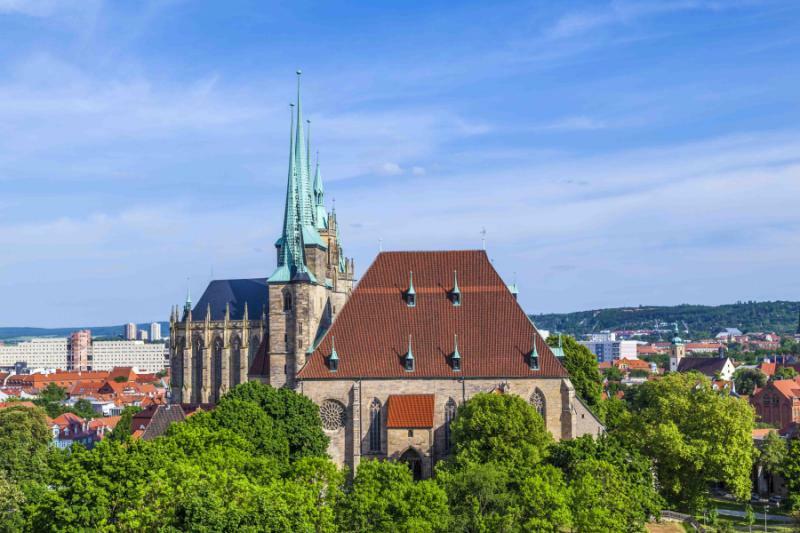 After viewing the family home and place of Luther’s passing, you continue to the dynamic city of Erfurt. The 21 spires from the churches, cathedrals, and monasteries create a stunning skyline for the city that was first established in the 8th century by St. Boniface. Merchants gaining wealth from the trade of blue pigment founded the university in the late 14th century, the site from where Martin Luther graduated. You can also pay a visit to the Augustinian Monastery, where Luther fulfilled his vow of becoming a monk if he survived a severe storm. The Itz River rushes beneath the Merchant Bridge known as Krämerbrücke. Half-timbered houses frame the stone bridge where locals continue to inhabit the 14th-century structure. The scent of chocolate emanates from a charming shop set beside the glinting jewelry displayed in the windows. You continue your tour of the cityscape, finding comfort in the mouthwatering aroma of the grilling sausages emanating from the numerous street vendors. The copper spires of Erfurt Cathedral draw passersby’s eyes to the stained glass windows adorning the nave. The masterpieces of the medieval stained glass told the stories of the bible and local folklore through the marvelous glow of the celebrated glasswork for those unable to read. 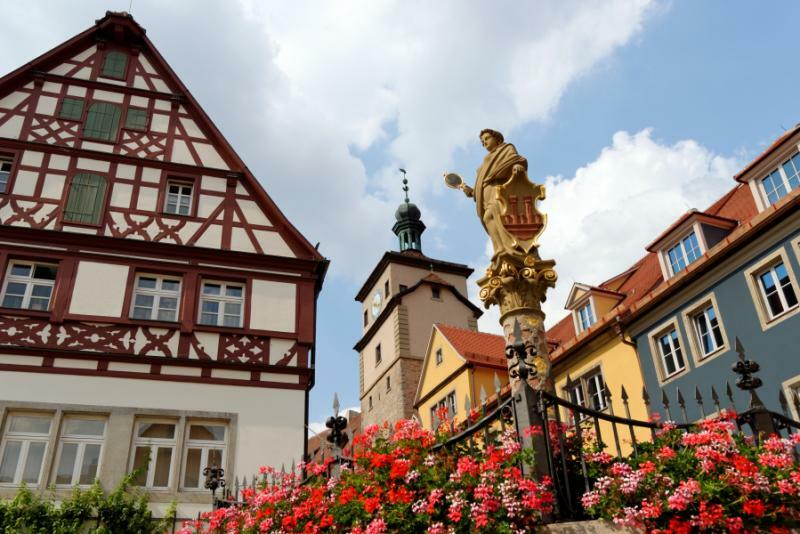 You meet your private transfer after breakfast and make your way to Eisenach, a town known for its ornate architecture and famous former residents: Martin Luther and Johann Sebastian Bach. You arrive at a gorgeous hotel offering views of the unforgettable Wartburg Castle. Your accommodation blends luxury and history, offering a touch of art-deco décor with alpine splendor for extraordinary views. Your guide leads you to the castle grounds where Martin Luther hid as an outlaw from the Inquisition after being sentenced to death by Charles V, Emperor of the Holy Roman Empire. The inner courtyard shimmers with half-timbered homes beneath red-tiled roofs. The white walls glow against the dark brown wooden trim. The castle was erected in the 13th century, maintaining nearly a millennium of history within its walls. 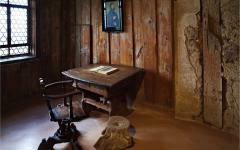 Martin Luther spent his time living in hiding within the castle, translating the Bible from Greek into German. The powerful translation in form, texture and verbiage shaped the standard German used in contemporary speech. The castle grounds held contests for the finest minstrels in Europe, captured in Richard Wagner’s opera Tannhäuser. Continue outside the castle’s grand exterior and onto the enchanting medieval streets of Eisenach. After visiting the Lutherhaus Museum, which offers cultural and historical context to the artifacts of the monk’s life, you continue to the home of Johannes Sebastian Bach for insight into another one of the city’s favorite sons. The museum resonates with music, from the sounds echoing through the galleries to the unique instruments once used for remarkable hymns. You can trace the career of the talented musical artist who, like Martin Luther, shaped the Western World forever. In the morning, the aroma of chocolate cake emanates from Café Moritz, located near the center of town. The interior contains an old fashioned ambiance amongst the scent of brewing tea, black licorice liqueur, and strawberry cream. You step into your private car after breakfast and make your way towards the fairytale town of Rothenburg. En route to the cobbled streets and storybook architecture of Rothenburg, you stop in Würzburg, a historic city of medieval architecture spanning the banks of the Main River. The vibrant grass and trees shimmer with emerald hues against the silvery stone of the arched bridges. 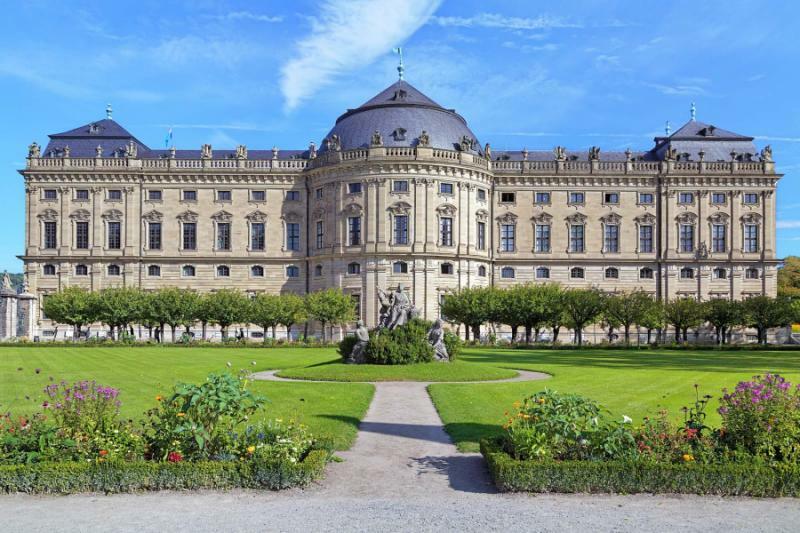 The 18th-century baroque architecture of the Residenz crowns the town and commemorates the opulence of the local prince-bishops of the past. The interior contains the Treppenhaus, a stunning, zigzagging staircase. Stepping beneath the vaulted ceilings creates a sense of wonder embodied in the 75-foot tall height of the gallery. 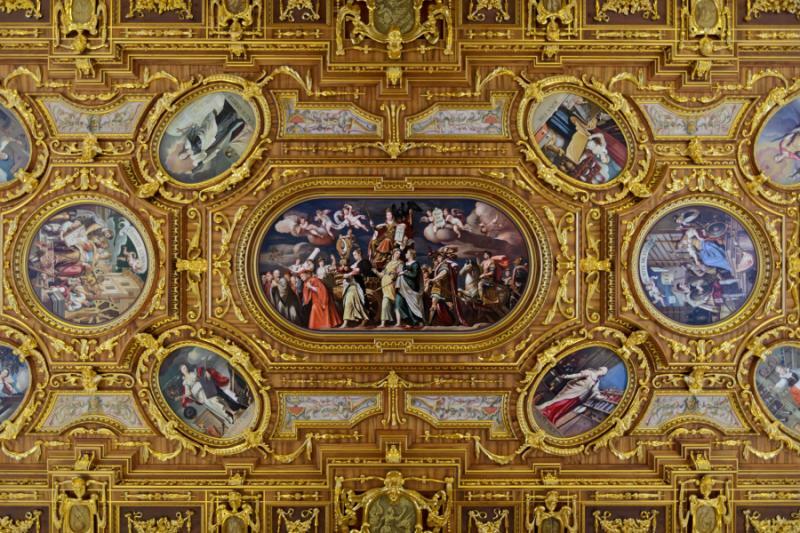 You turn to view the fresco draping over the ceiling, crafted by Giovanni Battista Tiepolo. 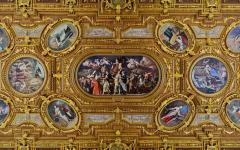 It retains the title of the largest fresco in the world and depicts Europe, America, Asia, and Africa, each represented by a famous animal from the continent, along with four allegorical figures. 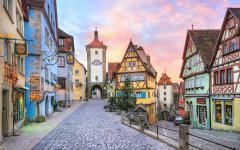 You continue to Rothenburg to find a web of cobblestone lanes winding between towered walls and houses. 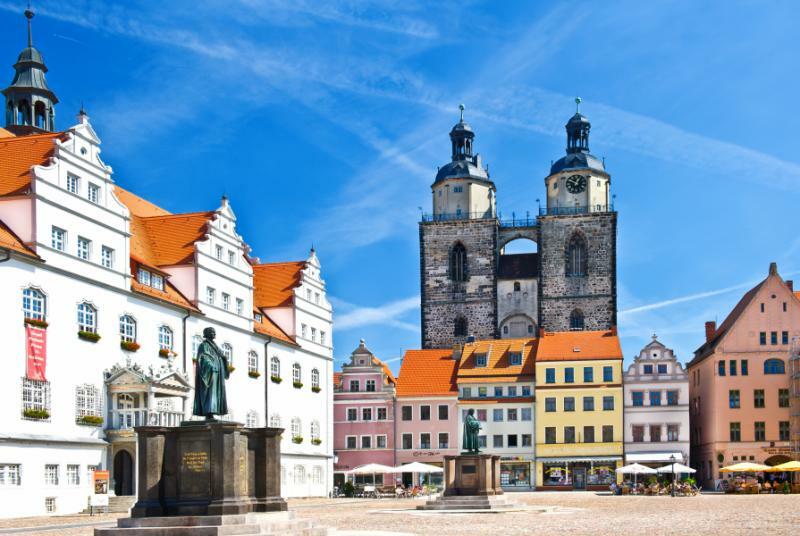 The settlement began in the 10th century along the edges of the Tauber River, with facades, shops, and squares preserved in 16th-century allure. Stroll through the aroma of crisp pine and freshly cooked dumplings emanating from the half-timber homes painted pastel green, pink, and yellow. The Town Hall dominates Marktplatz (Market Square) along the southern edge with 13th-century pomp. The tower was erected in the 16th century to reach a height of nearly 165 feet above the surrounding cobbled lanes. In the evening, you follow your guide on the Night Watchman Tour, wandering the narrow avenues in the atmospheric cool of the valley, listening to the tales of a medieval knight in authentic dress. The lamp flickers with light against the white walls of the surrounding buildings. Your guide’s voice echoes across the cobblestone. You half-expect the night watchman to call to arms and the entire town to spill out into the streets, ready to fight an invader. 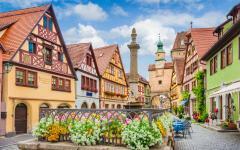 Optional: Enjoy an excursion to Nuremberg by adding an extra day to your overall journey for an immersive tour through the Imperial City of the Middle Ages. 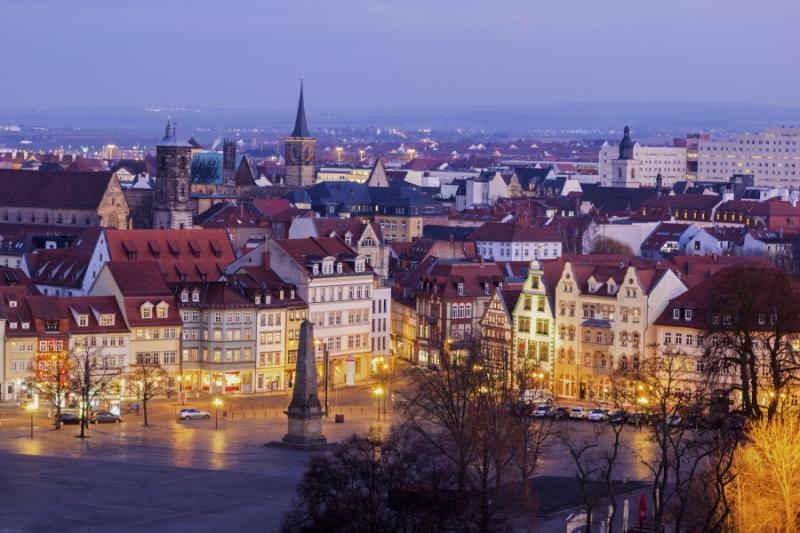 As Bavaria’s second-largest city, Nuremberg offers cultural delights such as beer as rich as coffee and one of the largest medieval town centers in Europe. Martin Luther famously spoke of Nuremberg as shining like the sun amongst stars. The city was reconstructed after World War II using the original stone on the main buildings, including the castle and historical churches. 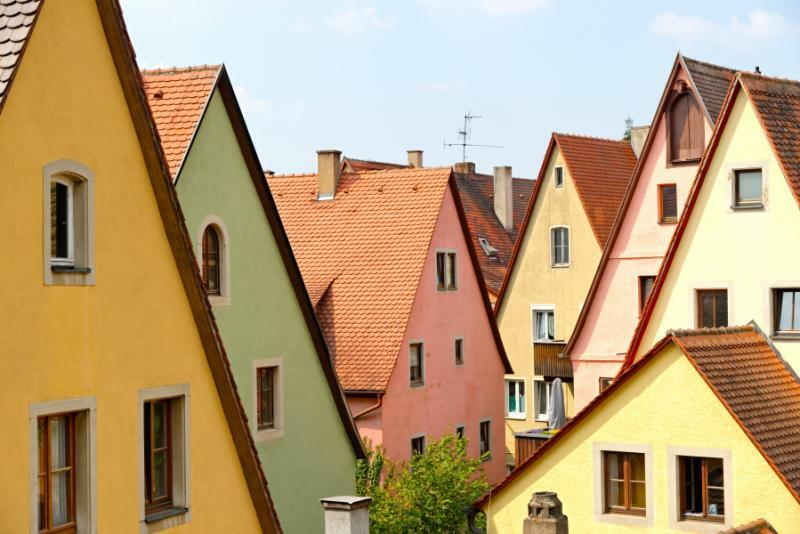 The red-tiled roofs of Rothenburg stand out from the evergreen hues of the trees surrounding the town. The remarkable stained glass window in the East Choir of St. Jacob’s Church shimmers in the morning light with elegance, telling the same biblical tales for more than 700 years. 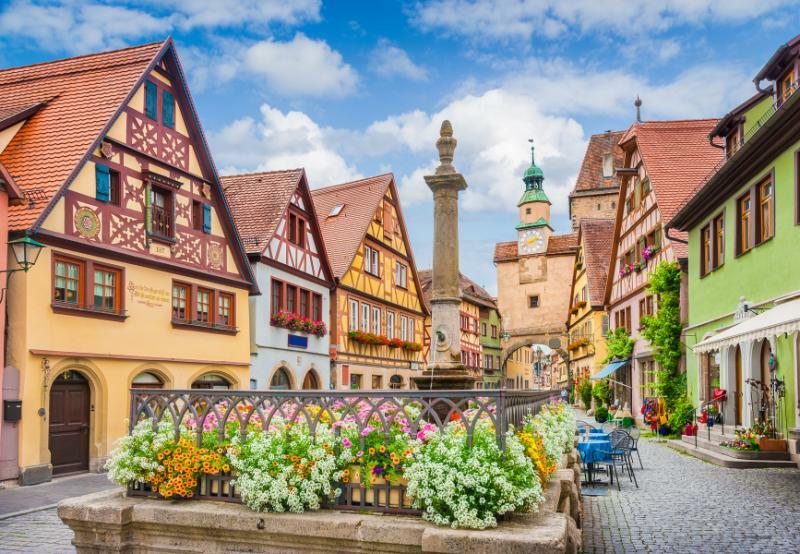 You leave behind the fairytale architecture of Rothenburg and make your way along the Romantic Road, stretching for nearly 250 miles along vineyards and the foothills of the Alps. Pass through the enchanting town of Dinkelsbühl. With more than 400 years of history, the half-timbered homes line the streets around the steep, sloping roof of St. George’s Minster. Fragrant lavender grows along the banks of Rothenburg Pond near the walls of the preserved Debtor’s Prions. 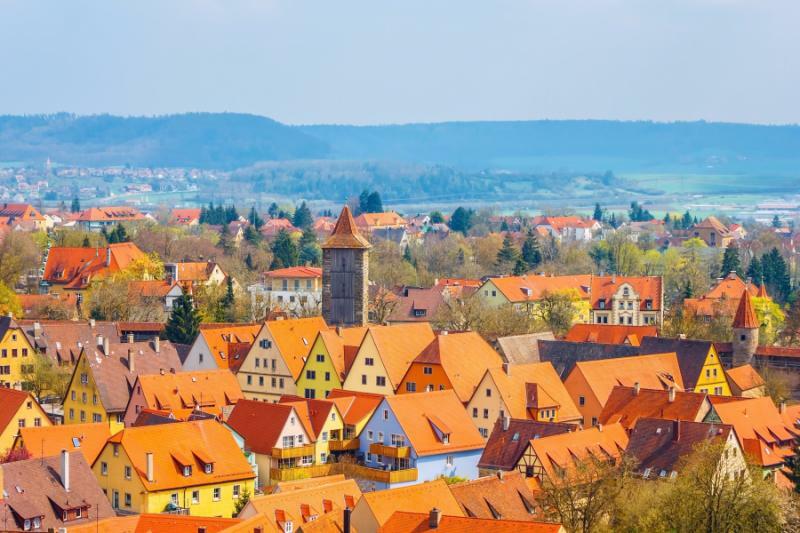 In Nördlingen, you stroll along the streets, beneath the red-tiled homes built inside an ancient crater created by a meteorite more than 14.5 million years ago. 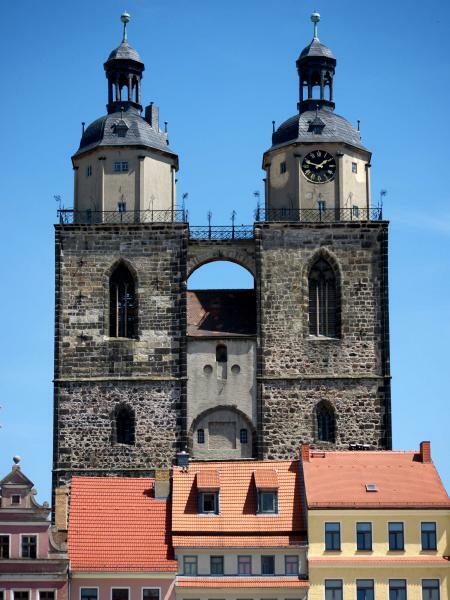 Locals refer to the bell tower connected to the gothic architecture of St. George Church as “Daniel.” From the viewpoint at the top of the tower, you can view the earth’s indentation around town from a height of nearly 300 feet, before continuing onward to Augsburg. The stepchildren of Roman emperor Augustus founded the city more than two millennia ago, becoming one of the wealthiest independent city-states in the 13th century. Spires soar above the cobbled streets, set along a city grid designed by the Romans. At the heart of the city stands the town Hall, which was completed in the 1620s. Onion-shaped domes adorn the two towers. The interior boasts a gigantic marble column and a vaulted ceiling inside the Lower Fletz. The Golden Hall shimmers with a canopy of the coffered and gilded ceiling. Murals add color and elegance to the dazzling display of wealth. 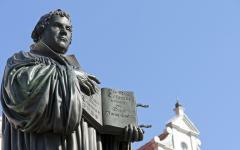 The trail of Martin Luther reappears through the history displayed in the city, connected to the early days of the Reformation. The halls of Fugger Palais once witnessed the trials of the monk as held by Charles V, emperor of the Holy Roman Empire. Luther refused to denounce his 95 Theses and remained loyal to his conscience. After breakfast, you set out into the countryside with your private transfer passing through the Bavarian alpine trees. The aroma of pine and cedar fill the air amongst the jade hues of the leaves. Before reaching Munich, you stop at Andechs Monastery, a brewery owned and operated by the Benedictine monks of St. Boniface. The grounds have been inhabited since the Roman Empire, leading to pilgrimages on the site beginning in the mid-10th century for the devout eager to visit the relics of St. Rasso. The monastery began in the mid-15th century, creating a period of uninterrupted prosperity for nearly 600 years. Sheep graze on the grassy hills outside the pink and white-filigreed spire. Votive candles in the Holy Chapel flicker against the walls amongst the herbaceous aroma of lingering frankincense. The candles, like the rest of the abbey, have a deep connection to history, as some of the oldest candles in Germany. The Alps on the horizon glow purple and gray. The scent of hops and barley fills the air, emanating from the monks’ beer hall and garden. You can join in a beer tasting to sample the variety of the ales the monks produce, continuing in a nearly 600-year-old tradition. Taste the Andechser Doppelbock, the abbey’s trademark beer, brewed with a Triple Mash for a caramelized taste, amber hue, and enriching aroma. 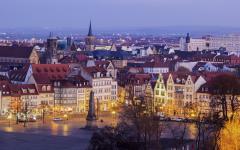 You continue to Munich and check into the lavish comforts of a boutique hotel near the vibrant Viktualienmarkt Square. The cobbled streets at the heart of the city bustle with activity yet retain a relaxed ambiance, with locals and visitors from around the world enjoying their day. The aroma of blossoming flowers and delicate herbs drifts from the market stalls in the square. Cabbage shines bright purple and apples glow a ruby red. Locals wander down the aisles of the marketplace in search of fresh meats, cheeses, sausages, and produce set across the 236,806 square feet. Your guide leads you on an encompassing tour of the city’s beguiling lanes and culture. 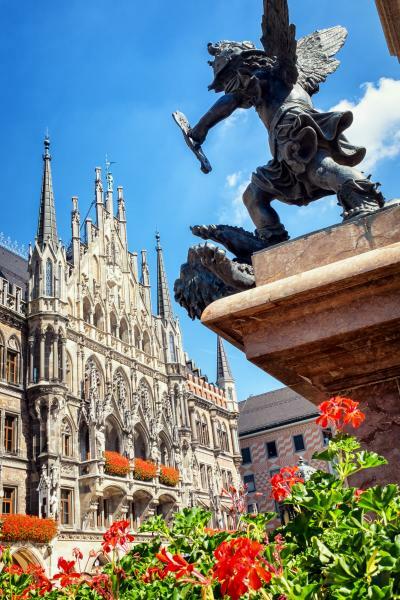 The famous Glockenspiel on the Town Hall chimes the 11th hour with 43 bells and 32 life-sized figures dancing along the tiers of the clock. 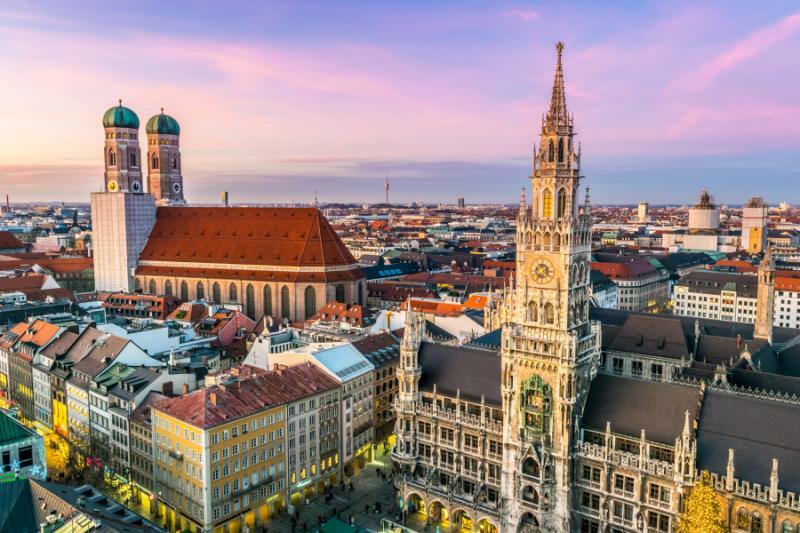 Munich remains a city more in-touch with its catholic history and church, allowing you to measure the distinct differences and similarities the Reformation brought to Germany. 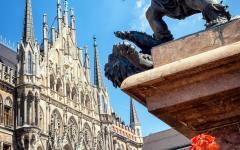 The twin spires of the Cathedral of our Lady were added in the 16th century, creating one of the largest gothic structures in Southern Germany. The 22 octagonal pillars support the vaulted ceilings over the nave and chancel, which hide the windows, with the exception of a single tall opening framing the chancel. An early 16th-century painting entitled, “The Protecting Cloak” depicts Mary holding her robes to protect humankind. The morning air fills with the aroma of rich melted chocolate and pralines around Viktualienmarkt, emanating from the cozy interior of Chocolaterie Beluga. Locals linger on the terrace of Stereo Café in the morning, watching the passersby drift along Residenzstrasse. Your guide greets you in the hotel lobby after breakfast and leads you first to the English Garden before reaching the Nymphenburg Castle, the summer residence of Bavarian Kings. 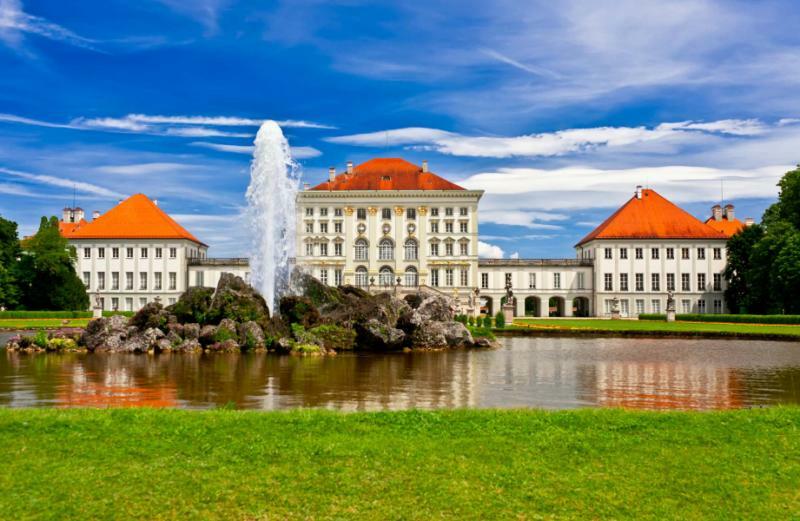 The palace was erected along the outskirts of 17th-century Munich, amidst open countryside flush with greenery. 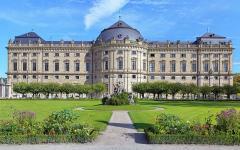 The commanding complex now stands within four miles of the Altstadt, with a stately villa and two wings paved with parquet floors and period rooms. The main avenue leading to the entrance creates a marvelous regal impression of rococo and neoclassical style. The grand hall overtakes three floors, decorated with marvelous wall and ceiling frescoes. The central ceiling represents Helios on his chariot. There are 38 portraits that adorn the walls of the former apartments of Queen Caroline. You find the striking image of Helene Sedlmayr, a shoemaker’s daughter, draped in an opulent gown offered by the king specifically for the sitting. 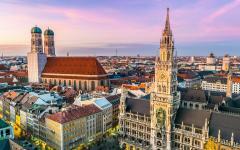 Upon returning to Munich proper, you continue to explore the charm of the distinct neighborhoods, including Schwabing, known for its chic ambiance, gorgeous English gardens, and World War II history. Optional: You can make your way to Dachau Concentration Camp with a specially licensed guide for a unique view of Germany’s first concentration camp located 20 minutes outside of Munich. The complex embodies the atrocities of World War II and provides sobering insight into the authentic history of those interned in the barracks. Optional: The Pinakothek der Moderne is one of Munich’s most captivating museums. The collections of contemporary artwork offer a chance to view significant displays of 20th-century artwork within the frame of stunning modernist architectural elements, from soft natural light to the eye-like dome adorning the main hall. In the morning, locals wearing lederhosen stroll down the cobbled streets. Café Luitpold in Odeonsplatz provides outdoor seating for locals to enjoy their flaky, buttery pastries while watching the city pass by. Subtle bronze stones are gathered in a small alley near the Feldherrnhalle, where Adolf Hitler led the Beer Hall Putsch in 1923. The colorful stones represent the path of passive resistance to those unwilling to salute the Feldherrnhalle. The monument stands as a salute to the Germans who never offered satisfaction to the Nazi party with a decorative salute. When you are ready, your private transfer meets you in the lobby of your hotel and escorts you to Munich Airport for your flight home. Instead of heading home, you could extend your time in Germany to further discover unparalleled charms and fascinating history. 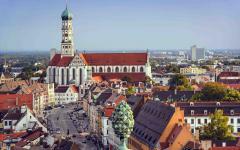 Venture to Leipzig to experience the old fairs and markets of the Saxon Lowlands. Enjoy the remarkable art and culture, along with the heart of the historical and contemporary book trade. Follow the thread of Johannes Bach’s time as director of the local boy’s choir before traveling the historic movement that ushered in the 1989 German Revolution, which culminated in tearing down of the Berlin Wall. Continue to Dresden, near the border of the Czech Republic, for a gorgeous discovery of a city that rose from the ashes of World War II to represent perseverance and opulence. Rococo and baroque architecture shimmers like jewels, from the Frauenkirche church to the Zwinger Museum complex situated inside an 18th-century palace. Step into the majestic world of the fairytale architecture of Mad King Ludwig on a visit to Neuschwanstein Castle. The 19th-century edifice was erected atop a sheer cliff, creating a dramatic effect of structural design and visual impact. Continue into the marvelous Bavarian Alps to ride the cable car to the top of Mount Zugspitze, Germany’s highest summit at 9,715 feet above sea level. From the peak, you have a view of over 400 mountaintops for an unforgettable scenic journey matching the storybook ambiance of the Neuschwanstein Castle. Continue following the trail of Martin Luther by visiting Mainz, a town propelled into prominence after Johannes Gutenberg invented the printing press, ushering in an age of information. The invention helped Martin Luther spread the ideas of the Reformation. You also have the opportunity to view the original Gutenberg Bible, the first book printed on the Gutenberg Press inside the town of Mainz. The town retains a sense of French culture from the days of Napoleon’s occupation, blending effortlessly with the ethereal stained glass windows of St. Stephan Kirche, which Marc Chagall crafted. The Rhine Valley radiates beauty and splendor with hillside castles, emerald fields, and vineyards producing enticing wines. Cliffs lead to forested knolls and idyllic half-timbered villages overlooking the meandering banks of the Rhine River. This customizable private tour starts at USD $3,249 per person based on double occupancy at premier accommodations. Mercedes E-Class (or similar vehicle of the same class) rental car including full insurance and unlimited mileage from Day 4 (Wittenberg) - Day 8 (Munich). This customizable private tour starts at USD $4,149 per person based on double occupancy at premier accommodations. First Class Train from Day 4 (Wittenberg) - Day 8 (Munich). This customizable private tour starts at USD $6,649 per person based on double occupancy at premier accommodations. Private Driver and Guide from Day 1 (Berlin) - Day 10 (Munich). The customized package will include accommodations, airport transfers, guided tours or activities, unique experiences, trip planning, and 24x7 support during your trip. "Our travel agent was terrific and very responsive in helping us figure out what we wanted to do."